Our family loves Caesar salad with grilled or crispy chicken strips. Here's a quick and easy recipe we put together at home with our kids. For the cost of one restaurant Caesar salad, we can feed our entire family of 6. The kids love it and so do we! It's surprisingly good and very filling. Enjoy! Bake chicken in oven, according to directions on package. While chicken is cooking, prepare salad. 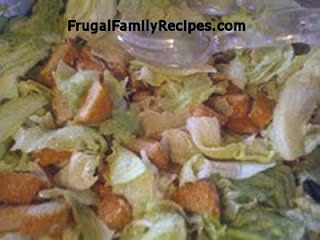 Cut washed lettuce into bite-size pieces and place in large serving bowl. Cut chicken nuggets into quarters, add to salad. Top with dressing, cheese and croutons. Toss and serve while chicken is still warm. Oh my goodness, y'all, it's delicious! What's for Dinner Tonight? Write to us!